(earphone). The E.F.P. 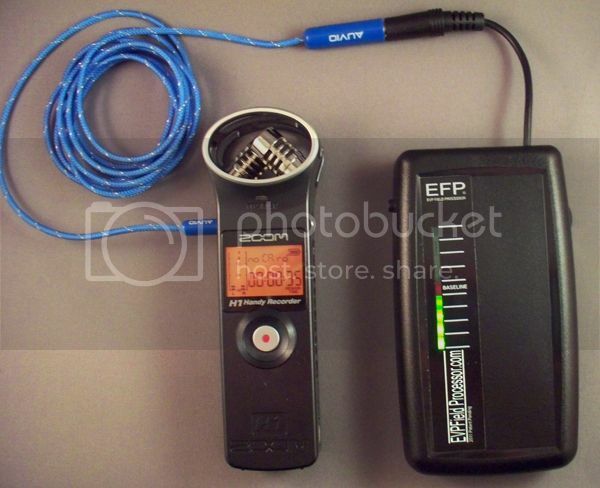 also has (1) 3.5mm audio output which can be used for earphone or mp3 type speakers. The E.F.P. has a "manual on/off switch" and built in "push button single LED navigational light". The E.F.P. operates on one standard "9volt" battery. The current regulation circuitry in the device provides hours of use. Our new EVP Field Processor arrived today! We are very anxious to get this little device out in the field and see how it really performs. We have matched it up with an H1 from Zoom because our little RCA VR5320R isn’t live audio monitorin...g capable. Keep that in mind if you are looking to pick one of these up. 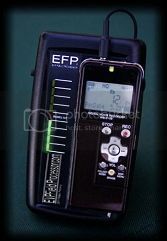 Your recording device must have live audio monitoring when recording or the E.F.P. will not work. One other thing we found immediately is that the 3.5mm input attached to the unit is too short to use if the headphone output is on the side of your recorder. (At least if you want to be able to mount the recorder to the unit as they suggest.) No worries… For $2.00 I picked up the blue extension you see in the picture. We will keep you posted on our findings and hope anyone else using the device will let us know how it is working for them. Here is the link if you are interested in picking one up.